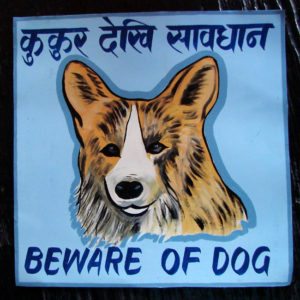 These are the lovely Beware of Corgi signs currently available. 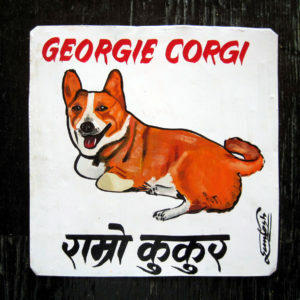 Reign is a blue-eyed Corgi, here hand painted on metal by the always fabulous Baba. Reign has a very intent glare in this one. 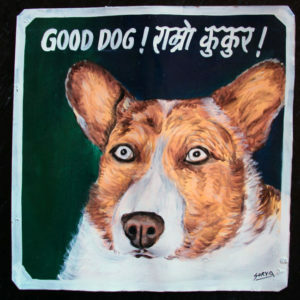 This charming Beware of Corgi sign is by Manoj from the Lakeside district of Pokhara. This painting is now available at The Dog Show in Brighton, England. Georgie the Corgi is a handsome fellow. However, he does not have a tail. Two out of three artists added a tail that was not in their original photo. 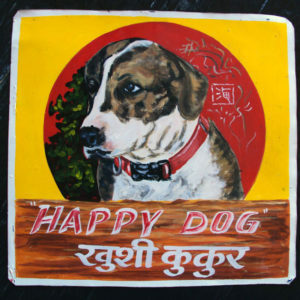 Nepali dogs have lustrous tails (in general). This portrait by Nara is exciting in its bold color palette. Georgie’s red and white coat really pops against the bright blue background. 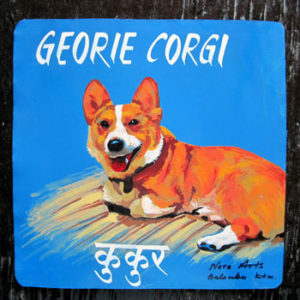 Santosh Shrestha painted this dramatic portrait of Georgie the Corgi.